Ever noticed that development of key communication silicon leads to whole new categories of connectivity? Consider Silicon Image (now Lattice Semiconductor) and the HDMI and MHL interfaces. How about Valens and the HDBaseT ecosystem? Now we have AptoVision providing FPGA-based chipsets to drive video, audio, Ethernet and more over conventional IP switches. This technology has the potential to really accelerate adoption of IP transport in the AV industry because it allows users to implement standard IP components in the AV network using switches and routers from Cisco or Netgear, for example. HDBaseT, the main competitor to AptoVision, requires similar transmit encoding and receive decoding at source and sink, but the network operates completely differently. According to AptoVision CEO Kamran Ahmed, "With our BlueRiver NT approach, the transport is all packet-based and IP routable so it operates on standard LANs. HDBaseT is a point-to-point solution which is not IP routable, hence it always requires proprietary circuit switches to form an AV switching network. That may have been fine for such applications until now, but for a truly flexible and scalable AV distribution network, a packet-based, and more importantly, IP-routable solution is preferred and is the way of the future." Other uncompressed AV switching solutions such as Crestron's DigitalMedia solution, AMX's DGX solution, Extron's XTP and Lightware's 25G solution are all based on HDBaseT and hence require proprietary circuit switches and the AV traffic is not IP routable. As a result, a separate independent IP-routable network is also needed for LANs. "The cost of an AV matrix switch from Crestron, as an example, can be up to 10X the cost of a similar 10 GbE switch from Cisco or Netgear," explained Ahmed. "That can represent a lot of investment savings with similar and even higher levels of performance. Plus, these customers will still need a separate Ethernet network. The AptoVision solution gives you everything in one infrastructure." At InfoComm, AptoVision announced their latest chipset solution called BlueRiver NT+. This solution (based on a Xilinx FPGA) allows the distribution of 4K at 60 fps and 4:4:4 color sampling on a 10 GbE network. But wait, this video signal requires 18 Gbps to transport uncompressed HDMI video, so how do you get this into a 10 Gbps pipe? According to Ahmed, they do two types of manipulation on the signal. The first one is mathematically lossless decoding from HDMI format to uncompressed-raw video format bringing the data rate down to 13.8 Gbps, while the second one, uses a light, zero-frame latency compression codec developed by AptoVision, to bring it down to 9.1 Gbps. Compression is typically only used where latency and image quality are not highly critical, mostly for video and almost never for high resolution text and computer desktops. But Ahmed claims their proprietary compression scheme is truly visually lossless, both for video and for high resolution graphics and only adds 7 lines of latency. If that is true, it could open up the use of compression in applications that would never have considered it in the past. While 4:4:4 color space is important for graphical data, the motion picture industry has recognized that HDR (high dynamic range) with 10-bits of color at 4:2:0 provides better quality for motion video than 4:4:4 color space at 8-bits without HDR. Consequently the standard for 4K on Blu-ray media, which is now locked down, is 4K/60Hz (4:2:0) 10bit with HDR. AptoVision technology uniquely supports this capability within the 10G envelop using mathematically lossless compression. But distributing video over a standard Ethernet network can be problematic as distribution of data is asynchronous, i.e. going out in bursts of data that can arrive at different times at the destination. To solve this, buffering is required, but this adds latency often even results in low frame rate and choppy video, which many applications can't accept. SMPTE has a solution for this called 2022 that encapsulates an SDI signal in an IP wrapper with timing. But this is limited to baseband audio and video signals, so AptoVision took a different approach to allow additional types of data to be transported in the stream. They developed what they call Adaptive Clock Re-synchronization. This is essentially a multiplexing technique that weaves in the audio, video, 1GB Ethernet and other signals, along with an embedded clocking mechanism. This scheme can recover the clocks for both audio and video at the decoder end with only a few lines of latency while remaining fully genlocked (synchronous) to the source clock across the entire network – even through an IP switch. And, each signal can be sent to any IP address independently. That's pretty powerful. So far, the company has secured a number of customers. Publically announced ones include DVIGear, ZeeVee, Aurora Multimedia, Grandbeing, AvenView and IDK Corporation. Ahmed says they are talking to nearly every AV signal distribution company (OEM) now, so expect more announcements later. At Display Summit, we saw this solution in action. 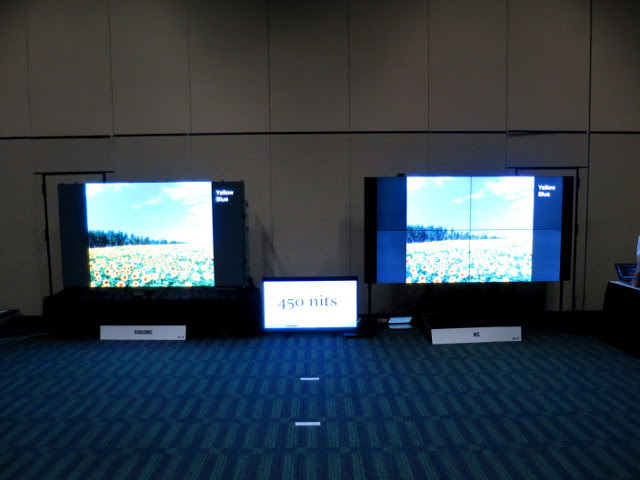 At the event, ZeeVee used a laptop as the source to drive an LED video wall and an LCD video wall with common content. Two transmitters accepted the HDMI laptop signal, encoded it for IP transmission and sent out the signal over fiber and through an IP Netgear switch. At each display, a decoder box converted it back to an HDMI for delivery to the display. It worked flawlessly. At InfoComm, DVIGear released their DisplayNet solution that uses "off-the-shelf 10 GbE technology to switch, extend and distribute uncompressed AV signals in real time at resolutions up to 4K." The new DN-100TX transmitter accepts multiple signals such as HDMI (with embedded audio and HDCP), analog stereo audio, bidirectional IR, RS-232, and 1GbE and transmits them over a 10GbE link up to 328 ft. (100 meters) using a single CAT6a or CAT7 cable. This link is then distributed via an off-the-shelf 10GbE network switch to the receiver unit (DN-100RX), which provides all the signals for output at the destination. The DN-100 Series supports uncompressed video up to 4K /30p (4:4:4) and 4K /60p (4:2:0) with no artifacts and zero frame latency. 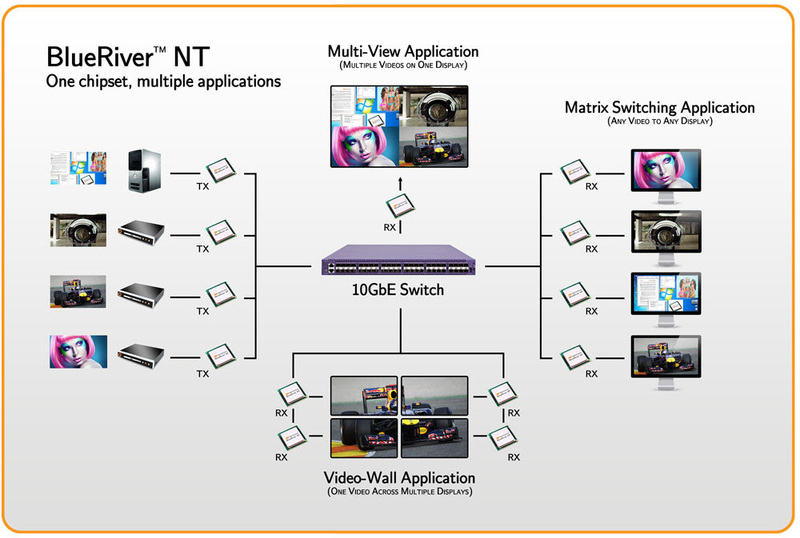 Video signals may be simultaneously routed in Point-to-Point, Matrix Switching, Video Wall, and MultiViewer (coming 2016) modes all in the same system. For more flexibility, each signal type (Video, Audio, IR, RS-232, etc.) is treated as a separate switching layer that can be routed independently. Other advanced features such as audio embedding and de-embedding are also supported. The DN-100 Series transmitter and receiver will begin shipping September 2015 at a suggested retail price of less than $1,000 per endpoint. So how do distribution companies differentiate their products we asked Ahmed. His answer was software. "Since the hardware is standard stuff and based on IP-based protocols, developers have flexibility in the way they manage and manipulate each signal type over the network allowing different configurations optimized for certain applications. Moreover, differentiating features, which previously required development of expensive custom hardware can now easily be achieved with software controlled packet routing. e.g. independent routing schemes for audio, video, and control "
You may have noticed that this solution is based upon using 10 Gb Ethernet hardware, which is perhaps a factor of 10x more costly today than 1 GB hardware. But it is still a lot cheaper than proprietary AV solutions. And costs will come down much more quickly in the IT world than they will in the AV world. Ahmed told us he expects 10 GbE switches to cost about 40% less in 2016 and drop to today's price of 1 GbE devices by 2017. Think that will happen with AV equipment? Ahmed maintains that proprietary platforms have stifled competition in many ways – and very few companies have the resources and means to develop a competing platform that can cost tens of millions of dollars to develop, particularly the AV switch. By allowing the use of off-the-shelf 10G, this barrier has been eliminated and smaller companies can now deliver equivalent and also much higher performance solutions without huge capital investments. These smaller players will now be able to innovate at the software level (on an open platform) and at a solution level rather than waste their resources on developing the baseline hardware. He makes a very good point and as a result, it now seems likely that standard IP switching technology powered by the AptoVision chipsets will make strong headway in the market. Any solution that uses off-the-shelf IT gear seems like a hard thing to bet against.